If you like luxury, confort, speed, performance, plenty space for entrertaining losts of guests and sleek modern look combined, this Sports Yacht is for you! This Sport Yatch will do up to 47 mph! 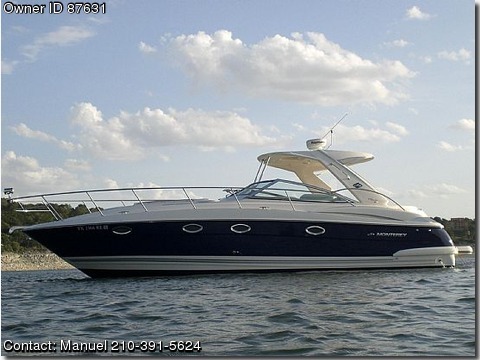 This is truly the fastest boat in its class and it handles like a small boat. Not like your Grandfather's cruiser. Fully loaded with all electronics; Computerized GPS, Radar, depth finder and fish finder in one screen. It is also the only Monterey 360 SY in the market with factory installed bow thruster. Includes many extras such as: bottom paint, brand new (never used), super plush, luxury down comforter and designer duvet in the master suite by Hotel collection; All lights in Yacht are LED and haloyen. Gourmet Nesspresso brand single cup, no mess, capuccino and expresso machine. Built-in bilge heater and trash can. Solid wood doors on aft, forward bedrooms, and restroom, provide total privacy. Built-in appliances include microwave oven, refrigerator, two burner infrared stove, DVD Player, 3 flat screen TVs. Separate cockpit ice maker and sink. Central heat and air conditioning + water heater. Only used in fresh water. 1 Owner. This Yatch is a true eye catcher inside and out!